This post is sponsored by Lisa Leonard Designs. Happy Tuesday everybody! Do I have a treat for you today! And what is that, you might ask? (Okay, you wouldn't really ask that if you read the title of this post...) Today, I've got a giveaway from one of my favorite shops...Lisa Leonard Designs!! Can I hear a "woot woot"? I'm sure you all know about Lisa's beautiful custom jewelry. Love. Love. Love. I've been wanting one of her teeny tiny initial necklaces for.ev.ah. But, did you know that she also has a line of lovely home decor accessories? They are seriously just about the sweetest things I've ever seen. And, just like her jewelry...they can be personalized! So you can imagine how excited I was when Lisa asked if she could send me something from her new line. 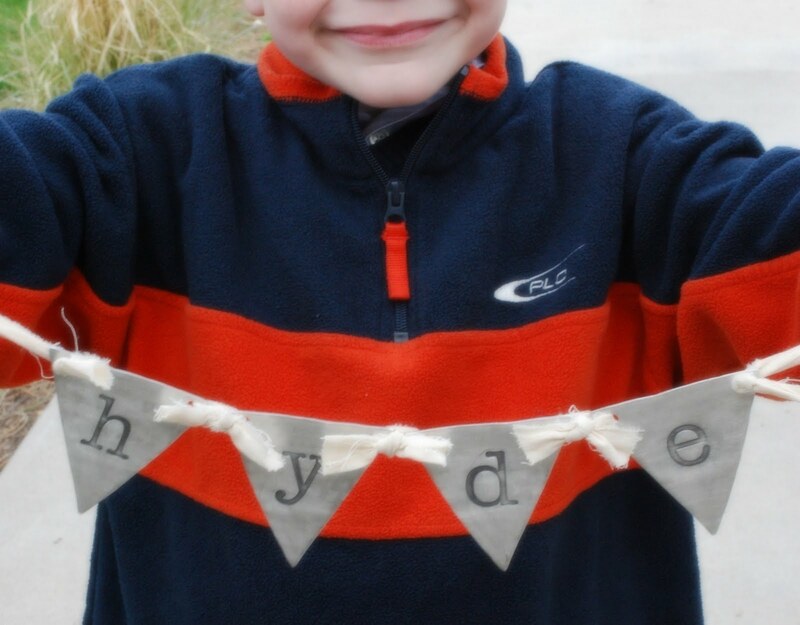 I chose the pennant banner...personalized with our last name. I simply adore it! Don't you just love this idea for portraits?...I'm going to have to take the pennant with us the next time we get a family portrait taken. In the mean time, Lisa has generously offered to give one reader of the Shabby Nest a $75 gift certificate good toward anything in her shop!! To enter simply leave a comment on this post telling me your favorite item from her new home decor line. You can tweet, facebook or blog about this giveaway for extra entries, but you must leave an additional comment for each in order for the entry to be valid. Giveaway is open until Thursday, April 28, 11:59 MST. I was given a pennant banner by Lisa Leonard to review, but the opinions expressed are solely my own. Oh how I LOVE Lisa Leonard & her designs! My fav is her new banners! Sooo fun and fabulous! I LOVVVVEEE the pewter wand!!! I love it all, but my favorite would be the pennant banner! I love the lovebird wall hanging, but the keepsake bowl is a close second! I love the pennants! Absolutey beautiful! I am torn between the keepsake bowl, and the hanging large font wall decor that is a heart. He stuff is so adorable!! I sure hope I win I love her style! I also put a shoot out on FB! I love the leaf ornament, but I have to say my favorite is the magic wand... I may not be eight years old any more, but it still makes me smile! I love her wall hangings. I may need to get one for an upcoming wedding gift! 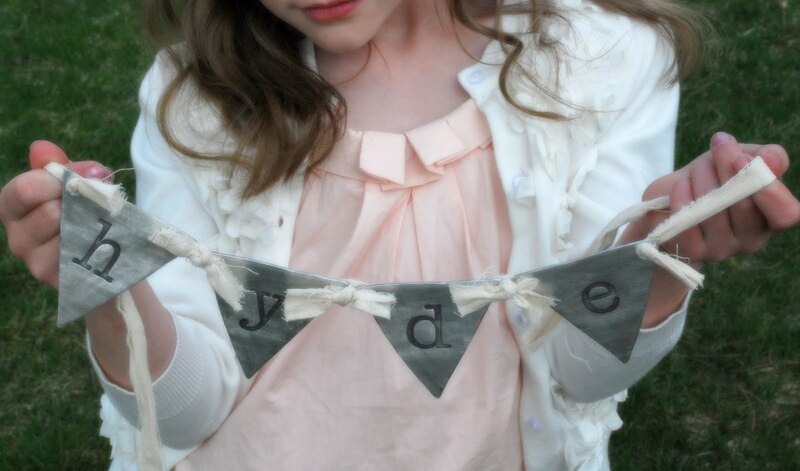 LOVE her heart banner...actaully, I am obsessed with it and would LOVE when that says family or love on it! I love the keepsake bowl!!! oooh my goodness i love those cute little magnets!! Thanks for this awesome chance to win!! I adore the pennant banner, but those magnets are just adorable, too! My favorite item's that keepsake bowl. So sweet! I love the keepsake bowl! Her designs are timeless. I am in love with the pewter star wand! What a first grade reading princess I could be with this!!!! LOVE the heart (that is almost redundant :) wall hanging. It would be gorgeous on a front door instead of a wreath. I LOVE the new banners! I love all of her items, truth be told! I'm really digging the Oval Wall Hanging. I'd put something sweet on it for our Master Bedroom. i love love love lisa's shop- and been dreaming of getting something there!! I love the pennant banner too... what a fabulous giveaway! I am a sucker for ornaments. I love the leaf and snowflake ones! LOVE everything in her home decor line, esp. her pennant banner!! My fave are her custom magnets!!! I love the keepsake bowl...adorable and practical!! Love the leaf ornaments and the custom magnets! I adore the keepsake bowl!! I love the banner the mostest! I absolutely love the new banners. Gorgeous! I love the heart and pennant banners! love the wall hangings and the banners!!!! I LOVE anything pewter but the snowflake ornament is just precious! The Pennant Banner is my absolute FAV on her site! I've been thinking for sometime about ordering one since I found her. Just trying to get it under 15 letters, LOL! I would LOVE to win this! BTW, just posted the giveaway on Facebook as well. I hope it doesn't create TOO much competition for me. hard to decide but i think i like the keepsake bowl. i have the perfect place for it. I love the magnets...and the banners! 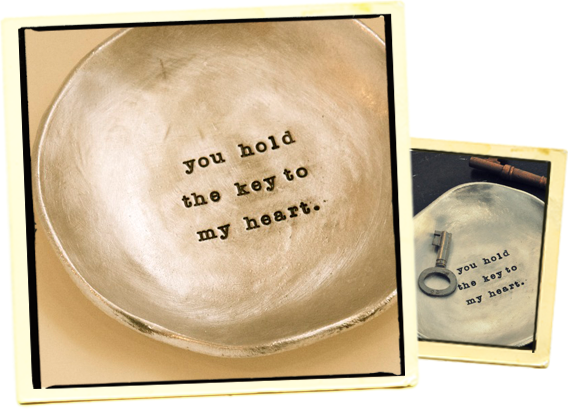 I love the "you hold the key to my heart" bowl. So cute! I had a hard time deciding between the keepsake bowl and pennant banner, but I think the bowl wins. I also facebook linked it :0). I love the snowflake ornaments and I would also love to own a necklace with the tiny initials! Love the magnets or the keepsake bowl. Oh how I hope I win because I've been looking for a necklace for a few weeks! I love the little 'you hold the key to my heart' bowl and the customised magnets amongst everything else! The leaf ornament! Without a doubt- that's what I'd pick! I love her stuff!!!! sweetheart tree necklace is my favorite! 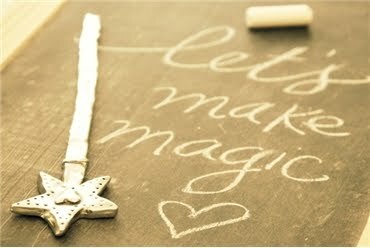 I LOVE the pewter wand. But I also love the pennant banners. They are so clever! I love the pewter wal hanging (large font) from her home decor line and the true love hearts necklace from her necklaces!! I love the pennant! That is my favorite! I really like the leaf ornament! I love the leaf ornament! It is beautiful. The keepsake bowl isby far my favorite item!!! I love it!! I love the pennant banner! Adorable. I really love her jewelery line too but my favorite thing from her home line is the leaf ornament. I also facebooked about the giveaway as well!! I love the snowflake ornaments!! I love the snowflake ornaments. Perfect for my collection. I the bouquet token, as I love flowers this is a lovely complement for them. I love the pennant designs!So Fun! I love it all - so adorable. I guess I would go with the pennant banner as well, but I do love the leaf ornament. OH!!!! I L-O-V-E the bird wall hanging! And the banners! I absolutely love the pennant banner! Super cute! I love the keep sake bowl!!! so cute! Swooning over the keepsake bowl. I have been admiring her jewelry for a while now but, the new home line is adorable. So simple and sweet. I think I love the banners the best...hard to decide! I love all her designs but the new keepsake bowl is precious! Thanks for the chance to win it! Oh I love the Pewter wand! simply amazing~! oh i just love that flag banner as well!! it's great!! I LOVE Lisa's designs, and I really love the new wand! I also shared this on Facebook! Love Lisa's banners, too!! I love, love, love the pewter heart wall hanging. It is beautiful! Hands down. The pennant banner!!!!!!!!!! To. Die. For. Love, love, love everything in the collection. I think I'd have to go with the pennant banner, but its so hard to choose! Thanks for hosting the giveaway and for spotlighting such beautiful creations! I love all things pewter--especially the keepsake bowl. I love the keepsake bowl! LOVE EVERYTHING! If I had to narrow it down I think the baby spoons and pennant banner are my favs! I love her items! I especially love the banner and the magnets from the decor line, so cute! Gorgeous! I adore the key bowl! The leaf ornament...which I'd be tempted to wear! Love the babies first spoon! Such a great idea for all these babies who are just arriving! Beautiful items! I love Lisa's things! My favorite is the heart banner! love the baby spoons. so cute! I LOVE this giveaway and am keeping my fingers crossed!I actaully really love the pewter wand, even though i have no use for it whatsoever - haha! I love Baby's first spoon! Great giveaway! I love it all, but my favorites are the heart banner and the custom magnets! Awesome giveaway! Thank you, thank you for offering this giveaway-I love Lisa's stuff-especially the pennant banner! I am in love with the wand! It is so sweet! I really like all lisa leonard designs, but my fav in the home decor line is the pewter heart wall hanging with Mr&Mrs on it. Would go perfect in our new home. I am torn between the banner and wand! So cute!! I love the keepsake bowl!! Thank you for this opportunity. I LOVE the baby's first spoon!! She's so talented! I especially like the lovebird wall hanging. Thank you. I love, love, love the bowl, or maybe the heart hanging. Both! I love the fairy wand so much, it would be the perfect addition to the gallery wall in my daughters room. Fabulous give away!! Baby's first spoon...we will need that in a couple of months=). I like the keepsake bowl! I love the magnets, they are so cute and different! The heart penant is beautiful. Wow. I have always admired Lisa's work, but have never ordered anything. I would be honored to wear her designs. Classic and stunning. So enjoy your blog. Thanks for sharing. the penant banner is my fave, but i also think the heart banner is pretty sweet! love the photo idea you had! oh my gosh! i was just lurking her site last night and making a dream list! Wow, what a fabulous giveaway!!! I'm like you, I love, love, love the teeny tiny initial necklace. My favorite from her new line of home decor is the keepsake bowl. the custom forks are what it is all about! just awesome. What wonderful stuff! I love the "key to my heart" bowl/dish and the leaf ornament! She has the best ideas! I LOVE everything!! but I really want the Pewter Heart Wall Hanging in the big font. So gorgeous!! Thanks for doing this! It is between the pennant banner and the lovebird wall hanging, but I think I'll have to go banner. The family portrait/permanent mantle decor ideas are blowing my mind. Love, love, love the pewter bowl! Would love to grab my keys from it every morning an see the special message! I love the Pewter Heart Wall Hanging with large font! Leaf ornament! That is what I liked best! I LOVE LOVE LOVE the pennant banner!!!! and I LOVE LOVE LOVE your blog!! I love the keepsake bowl and the heart banners. LIke so many others, I love the banner! Too fun! The heart banner is just lovely. Lisa Leonard has fabulous things! PS hope the ankle is doing better! Love, love, love her designs especially the hanging pewter heart! I Love the Heart wall pendant its very pretty! Thanks! I love the Keepsake Bowl! So beautiful! 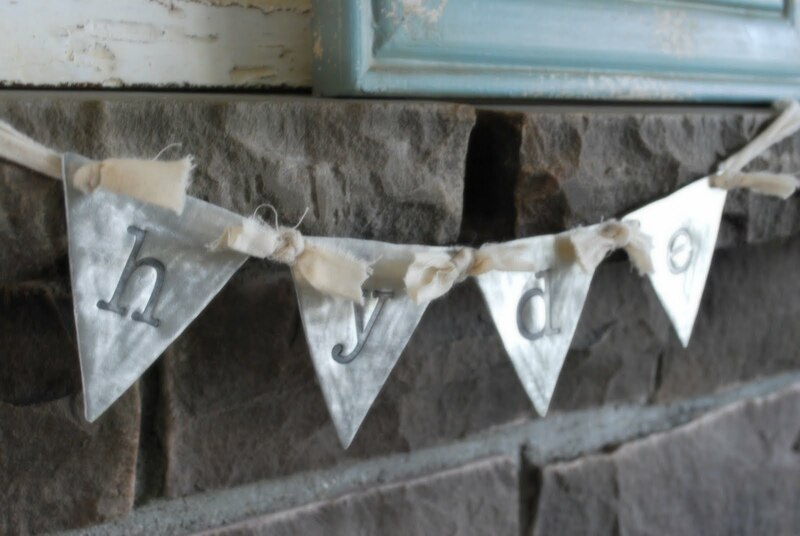 One thing I love from her new home decor line is the pennant banner! I would love to have one of those in our bedroom! I like the Lovebird Wall hanging, but they are all so wonderful - it would be hard to choose. It's all beautiful! I especially like the pennant banner! Love her stuff! I think my favorite in the home decor at the moment is the banner. The keepsake bowl is just perfect... thanks for the chance to enter! I am in LOVE with the keepsake bowl!! The heart banner! TOO CUTE! I love LL! It's a tie between the pennant banner and the heart wall hanging! I love Lisa's jewelry and am excited about her new home decor line. I love the little keepsake bowl and cake forks. All of Lisa's stuff is lovely, but I especially like the keepsake bowl! Lisa has such great stuff!!! I love the pennant banner!!! Love that banner, sooo cute! Great company. 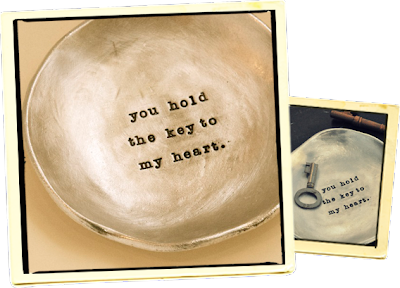 OMG i love this line, especially the keepsake bowl! I love her little magnents and the lovebird banner! I love both the keepsake bowl and magnets!! Thank you for the giveaway! I love the keepsake bowl. It's so clean and simple! The banner is fabulous but I would get the keepsake bowl. Lisa Leonard is my fav! I'm dying for one of the new pennants! i love the banner, but i think i would go for the bowl. beautiful and practical, especially for someone who always forgets where she put her keys! Woop Woop! I LOVE Lisa Leonard! My favorite item from her home collection is the heart banner! I just love the organic look of it! Thanks for the opportunity!! I love the leaf ornament to hang by my kitchen window & spin in the breeze, wishing spring was here sooner. The fairy wand I would place by my craft room door so the cleaning fairy has it at hand to make it easier to clean up after my creating. Oooh, I just love Lisa's designs. My husband just bought me a ring there for my bday with his name and our son's name. Love it. Hope to win this. My favorite in the home decor line is the heart banner. Fingers crossed, I really want to win. I love the pennant banner, too! I love the men's leather cuff! I'm already thinking about father's day. She certainly has some beautiful things. I love all her stuff, but the keepsake bowl is gorgeous - I think it would go in my sewing room! I love the pennant banner. I would have it made with my oldest daughters name. Just lovely! I love the the pewter bowl, it's a beautiful piece to any entry way for keys or change. Even the lovebird is cute. It would look great with my other birds on my mantel = ) It's so hard to pick just one they are all great pieces. I really love the magnets! I LOVE the 'keepsake bowl'! My husband and I will be married 10 years this June and this would be a prefect little gift that he could put his change, keys and things from his pockets at the end of the day on his dresser! Love it! The pewter wand is fantastic! I can just imagine it becoming a favorite of my daughter. I love the keepsake bowl! What a beautiful idea to hold keys, etc. And this would make an amazing wedding or anniversary gift too!